Harare`s financial oxymoron/City throwing money down the drain? For months, they diligently trained to enhance their physique. Without skipping a day, they ran from the National Sports Stadium around Warren Park 1 and back in their numbers. As they trooped the high density suburb they chanted war cries, a teaser of the task that lied ahead for them. The rigour they endured as they were being oriented is evident in the ‘boot on the ground approach’ they are expected to adopt. Officially, they are municipal police but in the streets of Harare they are known as Mahovhorosi and shouting the word midday along Robert Mugabe (downtown) can cause a stamped from fleeing vendors. Clad in ashy blue overalls with a waist elastic and a brown belt that is not exactly useful, bald heads and safety shoes, the team had been confiscating vendors` wares in a ruthless manner. “These new guys are heartless, they do not even handle our wares with care. If they raid you, there is no hope of recovering anything,” said Mutsa Mamombe a fruit vendor in downtown Harare. Their recent visibility in overalls was part of work related learning preparing them for confirmation as the biggest addition to Harare municipal police in recent years. In all this they were being conditioned for the city`s rejuvenated efforts to fight lawlessness. Last week, these 741 police officers got their badges ready to descend on the capital city albeit in a better uniform than their training fatigues. The recruitment, although seen as a master stroke by those who occupy Town House, there has been an outcry from residents who feel the resources could have been put to better use. Harare Residents Trust Director Mr Precious Shumba criticized the lack of transparency in the recruitment process. 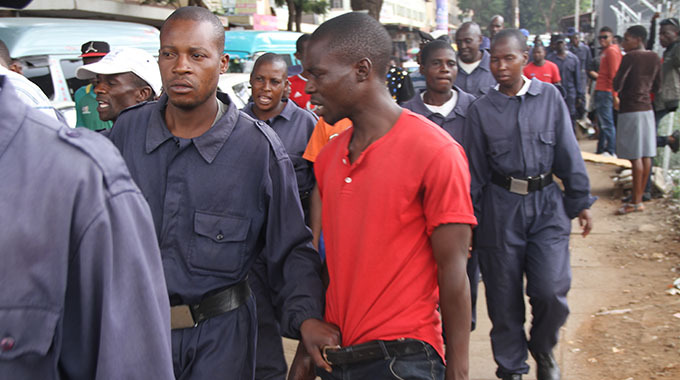 During their orientation, council police officers were trained to clamp down on lawlessness. However, residents have been skeptical about their effectiveness. “The City of Harare councillors are recruiting their political party activists in a manner that promotes partisan administration and governance of public affairs. It is a tragedy that at a time that service delivery is deteriorating and revenues are being eroded by inflationary pressures on the economy, City workers are lobbying for an upward review of their salaries and allowances,” Shumba charged. Council has been accused of turning a blind eye on their core mandate. “City of Harare is overpaying its staff, way above other local authorities, or other agencies of their like. Refuse collection is erratic due to fuel shortages excuses but the Office of the Mayor has reportedly been organising extravagant programs and activities that are largely designed to appease party supporters, instead of investing in the improvement of road rehabilitation and upgrading works, refuse collection and water delivery,” alleged Shumba. According to Shumba, the move could be anchored more on politics than service delivery. “The majority of the newly commissioned municipal police officers were recruited just before elections and more volunteer anti-litter monitors from the communities are reportedly being contracted six months to work for the council until they are made permanent employees, thus increasing the salaries and allowances paid to workers, thus reducing the City of Harare to be a partisan employment agency instead of serving ratepayers to their satisfaction by being responsive and sensitive. They hold ordinary ratepayers in contempt and have a full of we know attitude yet the majority of them have not held a single feedback meeting with ratepayers, except party Ward meetings, which are not ratepayers meetings per se. Extravagant programs must be stopped before it is too late,” Shumba queried. Does Harare afford such a luxury? Despite calls for the city to regularise its wage bill, it has employed 741 officers to run their blitz. According to sources the officers who in full complement with the existing officers are now just over 800 will be earning $1057 basic salary as they are in Grade 11. Former Mayor Ben Manyenyeni corroborated this amount on his Facebook when he wrote criticising the city`s extravagance. This means monthly the municipal police will be gobbling an excess of $800 000. In a year, the taxpayer would have bled around $9,6 million to sustain the force operating on behalf of a council struggling to import chemicals for water treatment. Service provision has been on a downward spiral in Harare, with residents hoping the new council will perform better than their predecessors. The recruitment of the officers, according to a source begun before the August 2018 harmonised election and was approved by the council in which Gomba was part of. Despite promising to be better than the previous council, the new crop rubber stamped the decision. With some faces retaining space in the new council including the incumbent Mayor Hebert Gomba, it seems it is a continuation from the old. As he released the graduates into the world, Gomba emphasized on the revenue collection function of policing. “This brigade is part of our road map to a World Class City by 2025. The officers will complement the efforts of their seniors in observing and ensuring legal trading and orderly movement and parking of vehicles in the City,” said Gomba in his speech. Gomba also warned his new troops against corruption, indicating that some in the new contingent had already begun engaging in underhand dealings. In his rationale of the mass recruitment, City Spokesperson Michael Chideme said Harare stands to collect more revenue than in previous years. “It is justified, the city is losing a lot of money in a lot of places where it is collecting revenue. The duty of these graduates today is to go and man those places where the city has to collect funds like the markets,” Chideme said, in defence of the move. 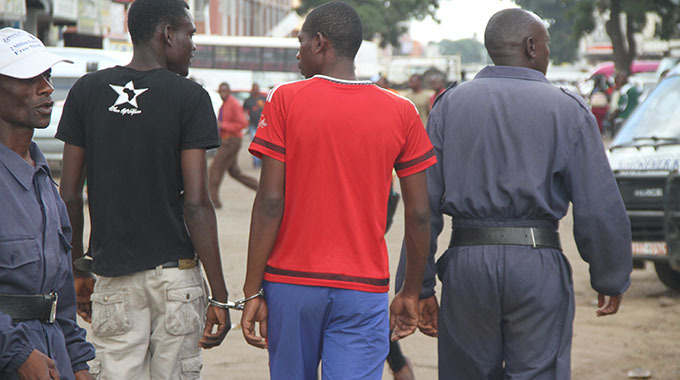 Harare traffic had become the wild-west and this police force will help police errant drivers, according to the city fathers. “We have a lot of indiscipline with the motoring public in the Central Business District where they disrupt traffic and it is again the duty of these officers to go and do work there. It is not an expense, they are going to be part of income generation, they are also going to police the city bringing law and order in the city. Once you bring law and order, you bring value to a place,” Chideme said. Former Mayor Ben Manyenyeni suggested that the city could have avoided increasing its salary burden by outsourcing security services from independent companies. “At this cost it makes pragmatic business sense to completely outsource this service to ZRP, Securico, Guard Alert, Fawcett and cut the cost of this service to ratepayers,” Manyenyeni wrote on his Facebook. The officers were trained in Criminal Law, Law of Evidence, Communication, Traffic Enforcement, Security Practice, Unarmed Defence, Drill, Statutes and By-Laws Enforcement. Harare is running an oxymoron in their policing system as they are trying to spend money to gain money. Whether this defence is based on fact remains to be seen, but ratepayers have registered an increased burden by adding around $800 000 to their wage bill for officers who do not have arresting powers. The same council reported to have sold land to pay salaries late last year just concluded the largest police recruitment in many years, a curious case of priorities.